In today’s ever changing economic environment, it is important for businesses to stay in touch with what customers want. Market surveys are a powerful way to discover trends in consumer demand, analyze potential for market growth and expansion, gauge competition, and get the real world information to make those important business decisions that will ultimately determine its success or failure. Direct interviews, telephonic surveys, mail and online surveys are powerful market survey techniques generally employed by businesses. With the advent of smart technology, it certainly makes more sense to use mobile devices to prepare and conduct surveys. Dooblo, a mobile survey software company based in Israel is behind the state-of-the-art mobile survey solution, SurveyToGo, that has been helping businesses around the world setup surveys on tablets and PDAs. In today’s post I take a look at how SurveyToGo works and helps setup tablet and PDA surveys incredibly quickly. SurveyToGo is free to try, so if you head over to Dooblo.net you can download and install the software. Installing SurveyToGo is as simple as downloading and running the EXE file and completing the steps in the wizard. You will need to register with a username, password, and company name. Once that’s done, the SurveyToGo Studio interface will open up and you can begin setting up your first survey. 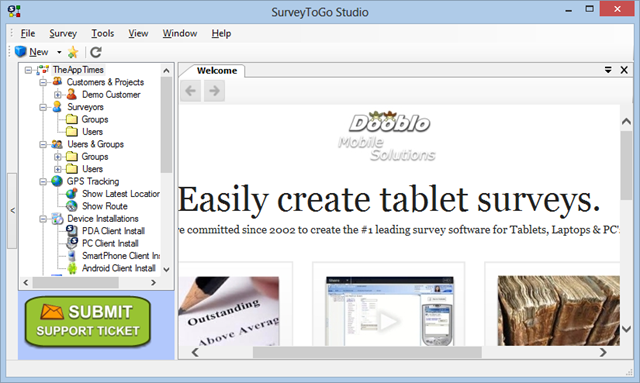 The SurveyToGo Studio interface has two panes; the left pane displays all the commands and functions needed to get started and the right pane is the work area. 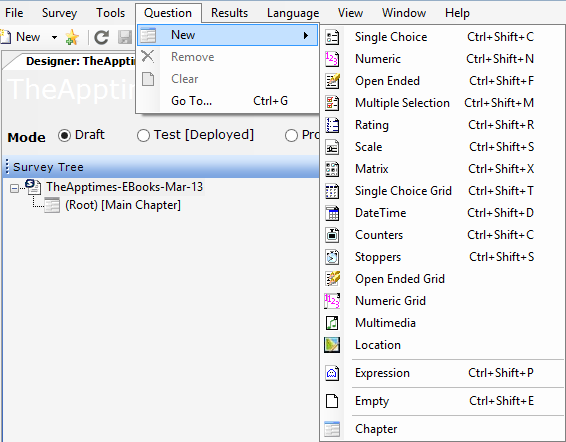 You can use the options in the left pane to get started, or use the more familiar File menu options. The interface though ordinary looking contains advanced features that make every conceivable type of survey possible. Plus it is pretty flexible too, you can hide the left pane when not in use, so you get more space in the work area. To start a new project, just click on the Start New Survey option in the right pane. The New Project Wizard will guide you through the process of creating a new customer, and adding a project and survey name. You can also choose to set up the survey for Windows based devices or Android based devices. Once you complete the wizard steps, you can start setting up your questionnaire. SurveyToGo lets you create questions from over 14 question types. Creating the questionnaire is pretty simple. All you need to do is select a question type, write your question along with the answer choices and click Add question. As you build the questionnaire, the left panel displays your questions. On the right pane, is an emulator that shows you how your question will look on the tablet device. There are many many options in the questionnaire section and users looking to prepare even the most complex survey should find what they are looking for here. Once the survey questionnaire is set up and tested on the emulator, you can move it to the live mode. This is just a matter of hitting the production button. Once that’s done, simply assign the survey to a surveyor. ( You can add as many surveyors as you want simply by using the right-click context menu.) Finally install the SurveyToGo client on the required mobile device. You can do that right from within the SurveyToGo Studio interface. 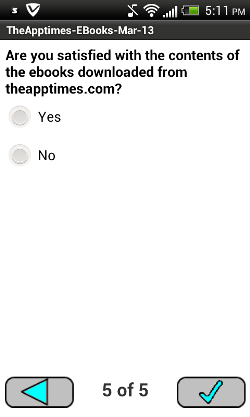 Once installed on your mobile device, simply login to your account, select the survey you created and hit Run. The survey will open up for the recipients to answer. All answers will automatically be synced to the server. The Operations area on the left pane of the SurveyToGo Studio lets you view and analyze the results of the survey. You can filter the results based on surveyors, production or test mode, observation status and more. You can also choose which columns in the survey you want to see. And for an in-depth analysis of the results, you can even export the data to a program of your choice; Excel, Word, Access or others. I spent about half a day on SurveyToGo and created and tested a basic sample survey in just under an hour. The website has a few demos for installing, creating and importing surveys, which you will find mighty useful. Run through the demos before your first project. You will get familiar with the interface faster and creating surveys afterward will be a breeze. Preparing the questions was just a matter of typing and setting options. Testing them on my Android device was a trouble-free experience. The survey results were instantly synced to the server and I could get real time results for analysis at the tap of a button. Overall, working with the tool was a pretty good experience. 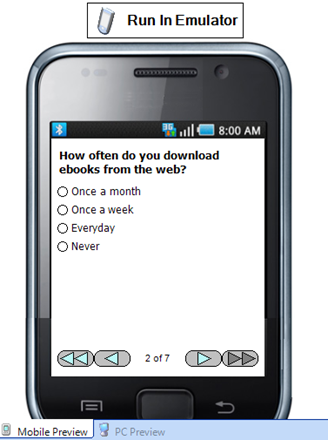 Support for data collection on Android, Windows Mobile & Windows XP/Vista/7 laptops & netbooks. It worked on my Windows 8 laptop too. Use survey logic to enable complex surveys such as skipping or filtering questions based on answers provided to earlier questions, looping through a series of questions, changing the order of questions based on previous answers and even rotating questions randomly. SurveyToGo offers a free trial download, so you can try it before you subscribe to one of their many plans. As a bonus, you can also check out their 50 preloaded interview questions. While the software is free and you don’t incur costs on installing or server setup, you will have to pay for completed surveys. This pay-as-you-go model offers packages from $99 to $ 1210 depending on the number of interviews ( 200 to 6000) you require. So there’s sure to be a package that suits everyone’s budget. For users looking for customer support, you can directly submit a ticket from within the tool. There are also PDF help manuals and training videos for guidance. Data collection and survey management is not an easy task. Especially when it involves paperwork, time and budgetary constraints. SurveyToGo aims to minimize the headaches that come with such a huge task and it does so quite brilliantly. If you are in the business of conducting survey’s SurveyToGo is a tool you cannot ignore. Head over to Dooblo.com and download SurveyToGo to check it out yourself. If you have used SurveyToGo for your projects, share your user experience with us.